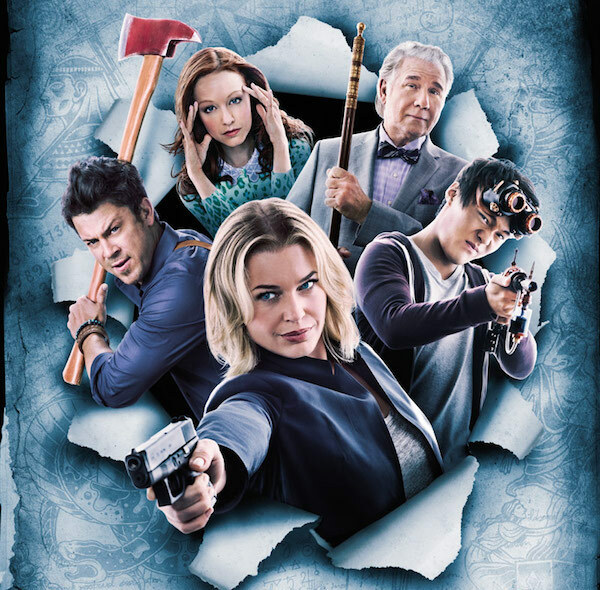 Are you familiar with The Librarians? It’s a fantasy adventure show whose second season premiere airs tonight, November 1, at 8 PM (ET/PT) on TNT. I started paying attention to it because it was developed by John Rogers, previously responsible for Leverage. It’s a spinoff of the three Librarian movies starring Noah Wyle as a mystical, knowledgable adventurer. He guest-stars in several episodes of the show, including the season premiere and finale. Additional cast members include John Larroquette as Jenkins, the grumpy researcher and caretaker of the Library Annex the team operates out of and Matt Frewer as Dulaque, evil villain who seeks to release magic to the world under his control. “And the Crown of King Arthur” and “And the Sword in the Stone” — The first two episodes introduce the premise, as Librarian candidates are being murdered, necessitating the formation of the team to protect those remaining. “And the Horns of a Dilemma” — The team’s first mission involves shutting down a corporate Labyrinth. “And Santa’s Midnight Run” — Bruce Campbell plays Santa! Fun holiday cheer for that alone. “And the Apple of Discord” — If a team member touches the apple, they become their most selfish self, which allows for some fun character contradiction. “And the Fables of Doom” — Fairy tales come to life in a small town, which is not a good thing; seeing who gets to be Prince Charming, and who the princess, is entertaining. “And the Rule of Three” — Magic makes competition at a high school science fair way too dangerous. “And the Heart of Darkness” — The team finds one of those classic haunted houses alone in the woods and try to help the Final Girl who escaped it. “And the City of Light” — A bittersweet romance for Jake in an electrically powered town with a secret. “And the Loom of Fate” — The season finale plays with alternate universes as each team member becomes the Librarian in a different setting, either jungle adventure, technological, or full-on magical. And a longer teaser that gives more hint of the season two focus, which is on “fictional” villains, including Frankenstein’s monster (Michael Gladis), Professor Moriarty (David S. Lee), the Queen of Hearts (Vanessa Vander Pluym) from Alice in Wonderland, and The Tempest’s Prospero (Richard Cox). That last features in the first half of the two-hour premiere, “And the Drowned Book”, in which a giant storm threatens New York City. It might be that TNT will alternate to the last five episodes at a later time on their website. They did this about a month or so before the new season, but it was for a very limited time. I will have to check and see if the Christmas episode is one of those first five as I wanted to rewatch it with my kids. It is — the Christmas episode is #4. Yea, TNT has finally discovered HULU. And this comes along just in time, because I am about to finish the last season of LEVERAGE.